The Career Services Center is excited to be including an STEM Section in this year’s Winter Career Fair on February 7th (Science, Technology, Engineering & Math). What does this mean for you? There will be a section featuring STEM industry employers or employers with STEM internships or jobs, as well as representation for some STEM student clubs. We are encouraging organizations to send employees from these areas, not only recruiters. All students of all majors are encouraged to attend as we will have a large and diverse group of employers participating. Of roughly 80 companies only about a third or fewer will be in this special section and many may have non-STEM opportunities as well! 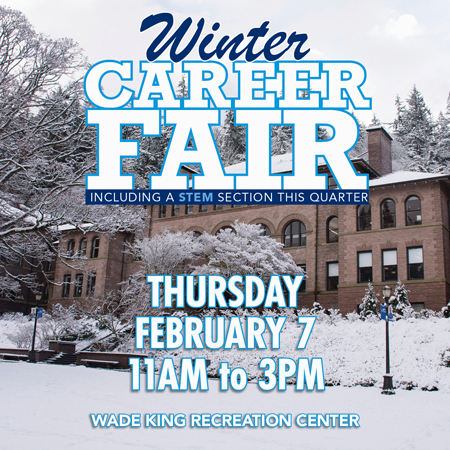 Contact the Career Services Center at 360-650-3240 or careers@wwu.edu if you have questions! Please click HERE to view jobs and internships visiting employers are hiring for!